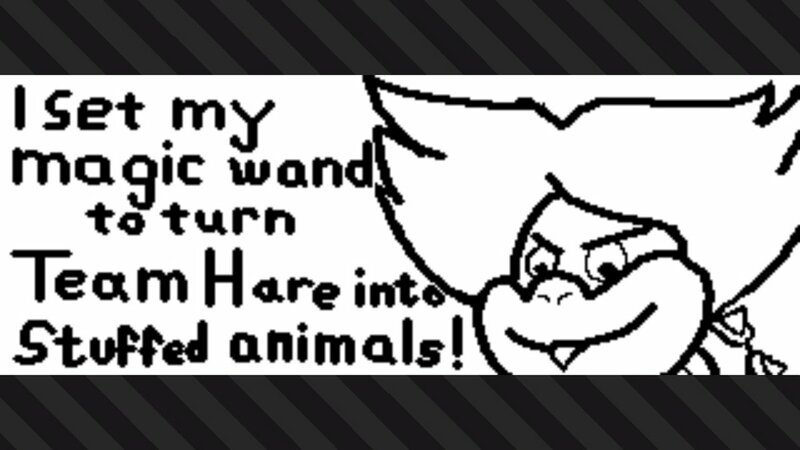 KoopaTV: Spring Fest Splatfest: Hare vs. Tortoise: The Rematch! Who Wins? First of all, it's obvious that KoopaTV has a naturally favourable opinion of tortoises. This site exists to promote and glorify Koopa Kingdom, a domain ruled by shelled creatures. Tortoises (and turtles) are fellow shelled creatures, and share a lot of common characteristics with Koopas. 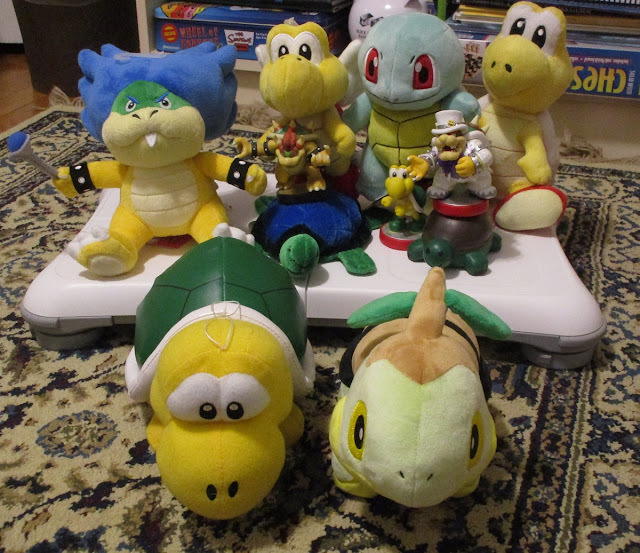 This extends past Koopas and to other turtle and tortoise entities, including this group photo of shelled Pokémon. Though I did get sick of the trio of Splatfests from last year featuring the Teenage Mutant Ninja Turtles. What a great cast of lovable shelled citizens and friends! There's no good hare characters. The strongest they got is Peppy Hare of Team Star Fox, and he's way past his prime. If you think I'm going to support Scorbunny, forget it. Still, as I pointed out, this is about who would win, not who I like. In that case, let me offer you resident Koopa racing champion, Koopa the Quick. 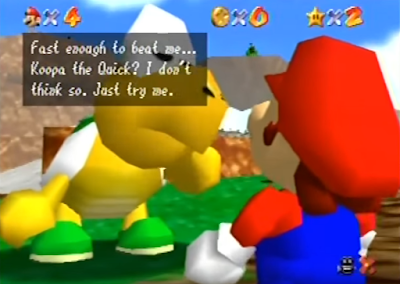 Look how (justifiably) smug Koopa the Quick is to that Mario menace! Koopa the Quick later inspired a whole squad of freerunning Koopa Troopas called the Roving Racers. These are far more skilled than any hares or MIPS. KoopaTV already has made a minigame about the hare vs. tortoise conflict, adding a horse in the mix as well. It's our “Slow and Steady” minigame (you can play it) from our hit 2017 videogame, The Wonderful 1237 (you can play that, too). Slow and Steady is JEB! Bush's minigame, where he is portrayed as a tortoise, having to outrace his brother George W. Bush the horse, and his father George H. W. Bush the hare. You could say that the minigame's premise inverts the whole race in that JEB!, represented as the tortoise, is the only Bush that failed to actually win presidential office. 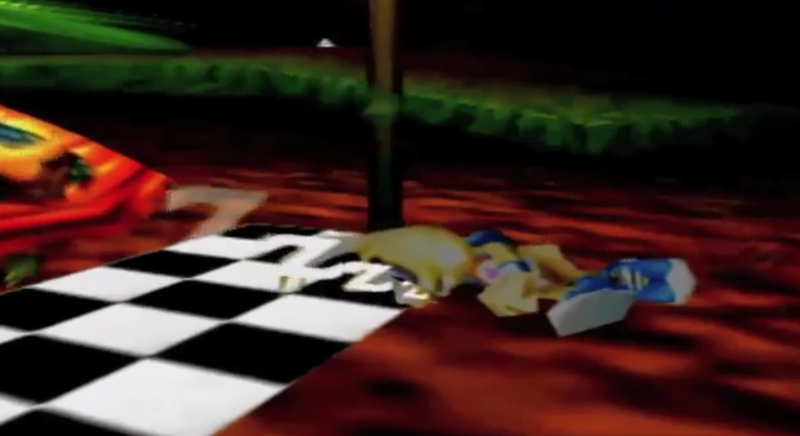 While he'll win the race if you win the minigame, overall, he lost his whole life's ambition and nothing will ever change that. ...I mean, it's not like he's going to run in the future and win, right? Right, America? Speaking more broadly about presidential politics, in 2016, Hillary Clinton's campaign was classically hare-like. Totally overconfident in victory (“Why aren't I 50 points ahead, you might ask?”) after being above Donald Trump in the polls for the entire campaign season (sometimes by a double-digit amount). Then she just stopped campaigning at the end. And lost. That's not saying that Donald Trump can be likened to a tortoise. No, he was also like a hare... but he didn't have a moment of low stamina. He never took a nap. He sprinted the entire time and won. The tortoise in presidential politics would be Gary Johnson and the Libertarian Party in general. They're very, very slowly increasing their vote share over the past four decades, going from below 1% to now just over 3% of the popular vote! They think they'll eventually win if they keep going slow and steady. Meanwhile, Ross Perot can come out of nowhere in 1992 and get 19%. I can't endorse the hare or the tortoise based on this perspective. As I mentioned in my opening, the Spring Fest has a strong Hare bias due to the worldwide popularity of Easter, which is also happening at the same time as the Spring Fest. For whatever reason, there is a mythical Easter Bunny strongly associated with Easter. Thematically I don't get it, and I don't see how it makes sense. As far as I can tell, the Easter Bunny is a retired hare that no longer does any exercise. It comes out of its cave once a year to offer up a lot of eggs. I assume all it does during the year is reproduce. Certainly not going to win anything, including a race. However, there is another holiday occurring simultaneously, and that's the Jewish holiday of Passover. Passover commemorates the Exodus of the Jewish slaves from Egypt. That was a long process by which G-d, through his chosen prophet Moses (guest-starring his brother Aaron), enacted a series of ten plagues on Pharaoh (with increasing severity) and the Egyptian people. According to ancient Rabbinical literature, Rabbi Akiba stated that the punishment (plaguing) of the Egyptians lasted twelve months. Even though the Jewish people were suffering and they could've left Egypt shortly after the plagues began without Divine intervention on Pharaoh's heart, there was a deliberate tortoise approach in dragging out the “national emergency” to last a year. While I personally don't understand the wisdom in the tortoise approach to freeing the Jewish people, the fact that it was His method means that it must be right. Can't argue with that. I suppose the Jewish people taking a nap during the splitting of the Red Sea would be a bad time and place to stop moving. Oh, in terms of secular holidays, there's the May-based World Turtle Day, created by the American Tortoise Rescue. That's a month from the Spring Fest. We're big supporters of World Turtle Day at KoopaTV! Almost all historical and contemporary evidence points to one conclusion: Tortoises are race-winners and more successful, while hares are unreliable and suspicious choke-artists. I will conclude that the tortoise will win the rematch, and I'm firmly on Team Tortoise. You should be as well. You could also summarise the conflict this way: Hares do better in short races with their initial speed. Tortoises win long races with their superior stamina. This Splatfest is twice as long as a normal Splatfest, making this a long race. Team Tortoise wins. But I think the whole article before that summary was quite fun to read (and write), don't you think? Tortoises also take the time to enjoy the whole journey, too! Congratulations for getting this far into the article! That means you weren't scared away by the promise of controversial topics, and perhaps you even read through those picture-less sections. Ludwig doesn't think he actually wrote anything controversial on those controversial topics, but just the mention of the words politics or religion might scare people away. Either way, are you a supporter of Team Hare or Team Tortoise? Do you have any other examples or major topic areas you'd like to discuss in the comments section? 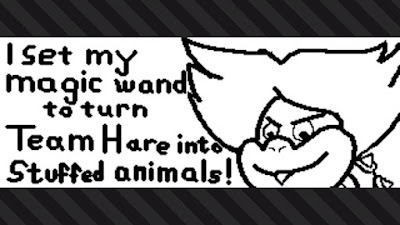 Ludwig is already backing away from his failed Team Knights pick from the previous Splatfest, with the magic wand usage and all. "There's no good hare characters. The strongest they got is Peppy Hare of Team Star Fox, and he's way past his prime." As for why it took longer than necessary for the Israelites to leave Egypt and then enter the promised land, the plagues was meant to be a teaching tool for both Egyptians and Israelites because human nature is very slow to change. Israelites were supposed to enter the land right away but the episode with the spies showed that they still had the slave mentality which translates to a victim mentality ("we were grasshoppers in their eyes") so the slave mentality had to be slowly weeded out via dying out and the new generation to enter the promised land. Fun thing is it was the Cannanites who were actually afraid of the Israelites as Rachav revealed to the second time spies were sent. "So slavery is to be abolished, but it is a fundamental principle of God’s relationship with us that he does not force us to change faster than we are able to do so of our own free will. So Mishpatim does not abolish slavery but it sets in motion a series of fundamental laws that will lead people, albeit at their own pace, to abolish it of their own accord. Here are the laws:"
So the Torah's way to abolish slavery is setting rules to make sure there are limits on how slaves are treated and eventually humans will come to abolish it altogether. I'd say Hariet's dress wasn't mass-produced as normal Crazy Cap fashion, but tailor-made. But then she allowed it to become a Crazy Cap regular, which ruined her uniqueness and really makes her a sell-out. ...And it apparently comes with hair and ears so I'm not sure what that means. Are Hariet's...real? "The Torah has already given us an implicit answer. Change is possible in human nature but it takes time: time on a vast scale, centuries, even millennia." On the slavery bit, Rabbi Sacks also mentions the War of Northern Aggression in there (US Civil War) and I'd say the proper application of the lesson is that slavery would've naturally been abolished due to economic realities, without crippling the states in the CSA. Not that the war's primary reason was slavery. That's a symptom. Within the context of the whole history of America you could say that was enough tortoising and it was time to finish the race, but the whole USA vs. CSA escalation was very hare-y. And it was a disaster for the states still felt today. Another excellent analysis. The hare is arrogant and thinks he has learned his lesson from last time but continues to make the same crucial mistake anyway. Even if the hare passes the tortoise at the beginning, the tortoise is steady and will not stop at all until the race is won. To further your argument in terms of popularity, the hares have the Raving Rabbids on their side and the tortoises don't. That alone is enough to convince me to join Team Tortoise. Believe me, when I wrote that the best the hares have is Peppy, I took the Rabbids into consideration. Utter losers.